Before astronauts are able to undertake long-term missions into the solar system, they’ll need technologies that allow them to grow their own fruits and vegetables. For years, NASA has been advancing technologies such as artificial lighting, plant monitoring devices, and growth chambers to advance that goal. But it’s one thing to grow plants; it’s another to keep them from aging prematurely. The culprit is ethylene—a naturally occurring gas emitted from plants that hastens ripening. Comprised of hydrogen and carbon, ethylene can induce decay when left to accumulate in enclosed spaces such as a spacecraft. To forestall that process, in the 1990s the Wisconsin Center for Space Automation and Robotics, a NASA Research Partnership Center located at the University of Wisconsin–Madison, developed an ethylene reduction device. Also known as an ethylene “scrubber,” the device works by drawing in air through tubes coated with titanium dioxide. When a built-in ultraviolet light shines onto the coat, the gas is converted into trace amounts of water and carbon dioxide, which are actually good for plants. The scrubber was first flown on Space Shuttle Columbia mission STS-73 in 1995 and proved successful in preserving a crop of potato seedlings. Subsequent missions used and improved the technology. Another company, Electrolux (now Dallas-based Aerus Holdings), of vacuum cleaner fame, also furthered the technology but took it in a slightly different direction. Rather than cleaning passing air, the company’s family of air purification products does something unique: it takes the circulated air generated by a building’s heating and cooling ventilation (HVAC) system and produces molecules that disseminate into the environment, killing pathogens in the air and on surfaces. Aerus Holdings’ Air Scrubber Plus incorporates NASA ethylene-scrubbing technology. The device is installed into home ventilation systems, which disseminate the product’s “friendly cleaners” that kill pathogens in the air and on surfaces. What’s more, these “friendly cleaners” are also mostly negatively charged ions. The majority of particles around the house are positive, so these ions pull these particles from the air, greatly reducing loose dust and pollen. 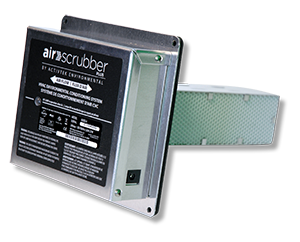 The Air Scrubber Plus is also available in models equipped with ozone, which greatly enhances the device’s ability to combat strong odors from pets and cigarette smoke. The benefits reaped by these two features—the antimicrobial agents and clumping capability—have been proven by peer-reviewed scientific studies, says Lozano. First, a Kansas State University study showed that ActivePure Technology reduced an indoor environment’s amount of methicillin-resistant Staphylococcus aureus, or MRSA, by 99.8 percent and E. coli by 98.1 percent. The study also demonstrated similar effectiveness in neutralizing black mold and other potentially dangerous pathogens. Besides making people feel better, Lozano says the technology also helps extend the life of a home’s HVAC system. As particles clump around the charged clusters, or “friendly cleaners,” they become too large to escape the system’s filter, which means they’re not able to go on and damage coils and blowers needed to help keep the system running effectively. “This translates to savings on your utility bills and reduces the chances of needing expensive repairs,” Lozano says.